I have tremendously learned from this discussion. Observing since my teen to present adulthood, the static of influencing the youth and framing on their future shape is remained intact. Hence, the current exit passage of the youth through new mean of social media shall result in a disorganized outcome. 1. Recalling my teen, i was influenced by parents, school teachers, community elders and political figures. My single mother encouraged me to work hard on school while she discouraged me from involvement with politics or social issues. Seeing with her own eyes of bitter social upheaval, she randomly warned me of don’t talk what you see, don’t say what you want, and she told to grow Ko tree and sesame plant to keep blind eyes and mute mouth with all political issues. At school, i was taught to use guns, to disassemble and assemble guns, and teachers instructed about crimes of Pol Pot, Kiev Samphan, and Ieng Sari, the teachers boasted confidently without any interruption on the political ideology of Max-Leninism in classrooms. At community, i was bullied by adults in a daily basis. Like i wrote in previous email, beside of instructing to use different tricks of zero sum game to overcome rivals, those adults repeated the phrase of “don’t teach all knowledge to your students because those students could topple you at the end”. I highly praised Premier Hun Sen through his speech played on public loud speakers about negotiations with Prince Norodom Sihanouk at the time. 2. I am remained disappointed to the popular proverb of “young bamboo shoots shall take turn from old bamboos” or “unity is power” while the mechanisms to make them happen are not designed or incentivized to design. Parenting lessons are not taught to students, to pedagogical courses, and to parents. Political system is vastly patron-clientalism in which has placed the learned and the merits-based culture at the marginalized spot. The national institution has not been established and often been ruined by the embedded cult of god-king. 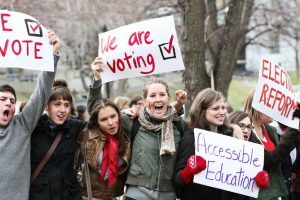 The present emerge of youth participation in politics is not regulated. It has been disincentivized by the institution. 3. The world and civilized states are embracing modern “growth mindset” while Cambodia is strongly seen in attaching to “fixed mindset”. When growth mindset praised someone on their efforts, accepting individual limitation, and to give up or sacrifice power as suitable time arrived, Cambodians are praising those with light skin with luxurious commodity and longed power status, or they are not been reluctant to admire their good Kamma accumulated in past life so that they could enjoy it at the present time without obstruction etc. 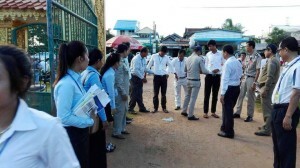 Instead of saying “keep on trying with this work”, Cambodian teachers might say “you are very smart” to their students. 4. According to figures by international researches, Cambodia has been well off in building up fat body but paralyzing citizenship’s mind. For instance, ADB praised 7 digits of annual growth and sometime named Cambodia as “tiger” but corruption and freedom of speech which are vibrant cells of blood and mind have been gradually paralyzed and inflicted adding on to the existing traumas. Youths are believed becoming byproducts of these paralyzing and inflicting machine. Buddha taught “all things are interconnected and inseparable (Pathiccasammudphatha)” as Nama (mind) and Rupa (body) are inseparable component of LIFE. Pragmatically, avihimsa (tolerance) and using wisdom to solve problems have always moved underneath the public eyes but this approach is active in all situations among justice lovers, the learned, and young generation. 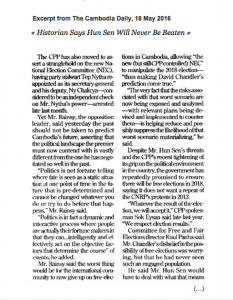 Ascertaining the dynamics of Cambodia politics, nearly 50% of popular votes CNRP attained must be used at the fullest. Apparently, law-makers must continue to constructively criticize inappropriate performance of the government-led party and regularly serve their voters at the constituencies. Inviting the Premier to clarify in front of the Assembly about the encroaching ditch digging of Vietnamese at the border at the Assembly and inviting minister of justice to answer those irregular activities are obligation of the minority voice representatives. Conduct deep research and study on power and prerogatives of the Minority group of representatives and use them at the fullest because this is the obligation of the representatives to audit all performance and incorrect activities of the officials in all levels including judges and prosecutors if they violated the laws and professionalism pressured by the powerful or indulged into four biases. Warning, punishing or taking disciplinary on those violated on “conflict of interest” are rudimentary. sector has been really neglected by the government. Beside of approving less annual budget for this sector, the intermingled family and community based educational development is remained a sensitive concern. When the fame of education has become worse and worse, the measure to strictly undertake high school exam is just a short term and trivial measure to answer to the true reform, and this measure is seen as a political agenda, not the education agenda. Just one stunning example of screening students at the entrance gate and proctoring from all directions by the proctors during exam, does mean to bog down the self-confidence and self-oriented mentality of the Cambodian students. Those screeners and proctors should spend time to monitor corrupt officers, traffic laws offenders, and other legal violators etc., is better. 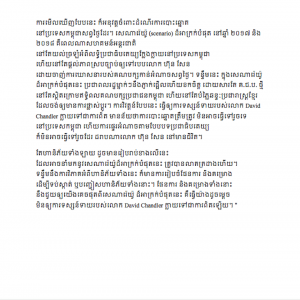 This part (43), Mr. Sophan Seng continued to analyse the Education Reform in Cambodia. This time, he keenly criticized the measure of strict exam of high school students (grade 12) during 2014 and 2015. The strict exam was only aiming to divert the attention of students’ parents who have disappointed with the inability to curb the rampant corruption inside the school compounds particularly during exams. Thus, these two years strict exam doesn’t translate the “Education Reform”, but it has translated something else outside of the core reform. Further more, the strict exam and measures to monitor all activities of students including scanning from toe to head to search students’ sheet(s) and proctor in each room by watching from all directions. Policemen are also dispatched. The other government unit such as Anti Corruption Unit (ACU) has also taken in charge to reprimand, arrest and punish those cheated during exam. 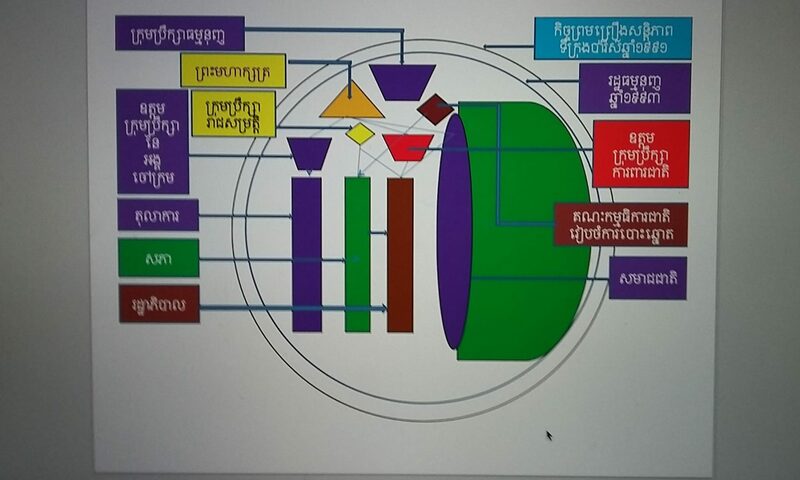 All these are just part of Cambodian education version that has no deep knowledge about the impact on students in a long term human resources building. Psychologically speaking, students have lost self-confidence that could help to produce self-correction and self-realization. Students are eagerly waiting others to enforce them. In term of law enforcement, students should not be the target. Those violated the traffic lights should be paid attention more than students who have learnt to gain knowledge, not to pass the exam without having knowledge. 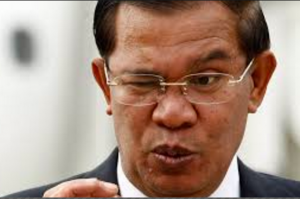 This tactic of reform will not lead Cambodia to gain genuine reform but to serve the interest of political campaign. 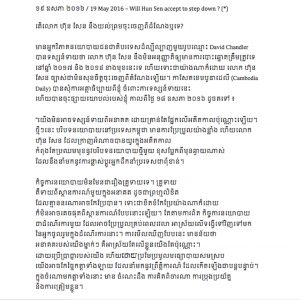 Cambodia’s education reform must not focus on strict exam, and strict exam should not use for the grade 12 exam, but it should be used for high professional competitions or privileged universities entrance etc.